Those who have spent any significant amount of time convalescing will tell you that nothing speeds recovery along like a worthwhile diversion in the form of an epic tale. When you add thrills, romance, and laughter to the narrative, you create a powerful, side effect free unparalleled prescription for health without the need of co-pays, waiting rooms or HMO red tape where there aren’t any deductions for preexisting conditions and you never have to deal with a clipboard full of paperwork. Imagine your doctors in residence weren’t the test-happy first year medical students still trying to master the right way to hook up a catheter or IV most of us face at our local hospitals but rather Being John Malkovich filmmaker Spike Joze, Zodiac helmer David Fincher and the innovative fellow music video director turned feature filmmaker Tarsem Singh and you’ll begin to get a better sense of their cinematically experimental procedure where reels of film and not dangerous drugs replace mood altering anesthesia. And comparable to the wonderful program Doctors Without Borders, imagine sending this cinematic dream team of Filmmakers Without Borders to expertly stitch together twenty-six locations over four years in more than eighteen countries (IMDb) in Tarsem Singh’s highly anticipated sophomore follow up to his critically acclaimed first feature, The Cell. Already, the work, entitled The Fall has divided the critics into largely two factions of those who feel his film is a masterpiece and those who call the mad-scientist’s resulting epic an infuriatingly self-important vanity project. However, for my money, Tarsem succeeds where others like Donnie Darko director Richard Kelly failed with his atrocious second feature Southland Tales, in admirably taking risks but like a good doctor, Tarsem contemplates each move with stealth like precision, making sure that the benefits outweigh the negatives for his unforgettably dark, brilliant grown up fairy tale, The Fall. From the breathtakingly bizarre black and white opening montage set to music and staged as though it were a silent film to its overwhelming eye candy that seems to pour off the screen in each daring frame as it continues, Tarsem’s Fall combines the scope and ambition of a mainstream Hollywood blockbuster with the artistic risk taking of experimental cinema. Admittedly as one who has never been overly keen on fantasy, I worried that it was going to be as bloated and pretentious as some of the critics described but I was quickly taken in by the riveting tale, which was inspired by the 1981 Bulgarian film Yo Ho Ho. Set in a Los Angeles hospital, we first meet our precocious five year old heroine Alexandria (Romanian newcomer Catinca Untaru) who, still recovering from a broken arm after picking oranges in a grove along with her impoverished family, forms an unlikely attachment with Roy Walker (Lee Pace) a heartbroken, suicidal film stuntman whose legs were damaged after he attempted a ridiculous sequence jumping from a train bridge onto a horse. Unable to move on with his life because he’s lost the woman he loved, Roy distracts himself along with Alexandria by first sharing with her a story of her namesake Alexander the Great and afterwards, telling her a fictitious epic tale of five heroic men (including Charles Darwin) who aspire to kill the horrible Governor Odious. As the story continually builds from one exciting adventure to the next, Roy begins to subtly blackmail his young friend into procuring enough medicine for himself so that he may end his life, only to have some of his plans backfire in unexpected ways. Although the bleak nature of Roy’s outlook on life might have been unbearably sad in another’s hands, Singh fills his film with surprising amounts of black comedy, near-misses as the story Roy begins to tell suspiciously morphs into a catharsis when reality and fantasy are blurred as Roy, Alexandria and others they know in the hospital and in their lives begin to make appearances in the emotionally intoxicating and artistically dazzling saga. 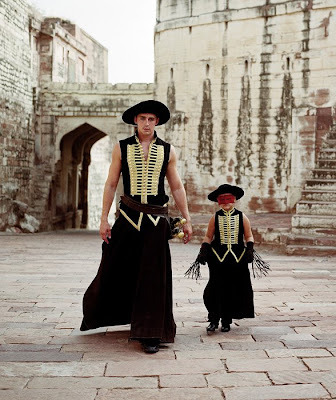 However, I must warn that it becomes extraordinarily brutal near the end causing us to shift uncomfortably in our seats in trying to anticipate just how Tarsem will conclude the film. Despite this, admirably The Fall rises from the obvious label of a spectacle picture due to the sheer amazement to be found in the magical sequences that will haunt your dreams after the viewing, by providing a satisfying emotional payoff as well for both of the characters we’ve come to know and love, and both of whom we realize could not have healed without each other nor the unforgettable tale. And that’s better than an allergic reaction to a prescription medication your insurance won’t cover but the doctor insists you need any day of the week. In other words, go to the cinema and call me in the morning.